Various Democratic candidates for president said they will not be attending the American Israel Public Affairs Committee's annual Policy Conference, with the sole exception of New Jersey Sen. Cory Booker. According to Politico, Sen. Kamala Harris (D., Calif.) confirmed through an aide Thursday that she will not be attending. Sen. Elizabeth Warren (D., Mass. ), former Rep. Beto O'Rourke (D., Tex. ), and Howard Schultz will reportedly do the same. The day after the Washington Free Beacon reported the slew of candidates not attending, Jewish Insider reported Booker will speak to the New Jersey delegation. A representative for former Rep. John Delaney said he had hoped to attend, but could not. "John is very disappointed that he can't attend this year, he has attended every year since he has been in Congress and he very much looks forward to being back next year," he said. The trend follows the progressive organization MoveOn circulating a petition calling for all Democratic candidates for president to avoid the annual pro-Israel summit. Harris has previously spoken in warm terms at AIPAC's Policy Conference, calling it "an honor" to speak there in 2017. Other declared presidential hopefuls, such as Sens. Cory Booker (D., N.J.), Kirsten Gillibrand (D., N.Y.), and Amy Klobuchar (D., Minn.), have made similar remarks. Code Pink, the radical left-wing organization, has asked candidates to do the same. In a fundraising email, it asked supporters to pressure Harris to reverse her relationship with the organization. 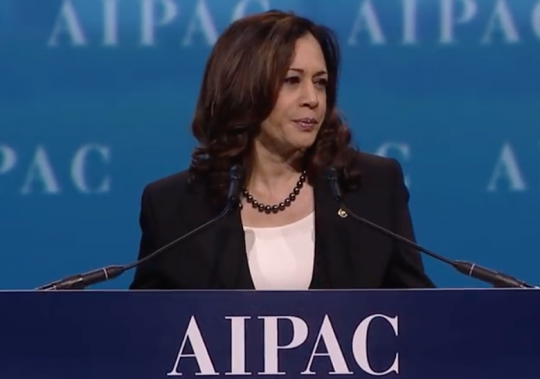 "Last year when Senator Harris attended AIPAC she told an audience of thousands that the history of the US Civil Rights movement is what inspired her to support a strong U.S.-Israel alliance," it said. "Now that she is running for president, we hope her position has changed and that she and all 2020 candidates will make clear that they are on the side of Palestinian human rights by skipping AIPAC." AIPAC is a non-partisan organization that seeks continued support for the U.S.-Israel relationship. AIPAC does not rate, endorse, or donate to candidates. It officially supports a two-state solution, with a Palestinian state coexisting with a Jewish Israeli state. Other 2020 Democratic aspirants Julian Castro, Pete Buttigieg, and Sen. Bernie Sanders (I., Vt.) said they will not be attending the AIPAC event, according to the progressive news site Splinter. Every year, some 18,000 participants converge on Washington, D.C. to discuss, celebrate, and lobby in support of the U.S.-Israel relationship. The event, set to begin Sunday, comes weeks before Israeli elections. Israeli Prime Minister Benjamin Netanyahu will address the conference. Presidential candidates, as well as rank-and-file members from both parties, frequently attend the summit. The event offers a prominent stage, media coverage, and the chance to meet donors seeking candidates committed to continued U.S. support for Israel. Confirmed speakers this year include New York City Mayor Bill de Blasio (D., N.Y.) Speaker of the House Nancy Pelosi (D., Calif.), Senate Minority Leader Chuck Schumer (D., N.Y.) and House Majority Leader Steny Hoyer (D., Md.). Then-nominee Hillary Clinton (D) spoke at the 2016 conference, as did President Donald Trump. AIPAC works to maintain bipartisan support, a task made more difficult by some members of the Democratic Party intent on making Israel a wedge issue. Rep. Ilhan Omar (D., Minn.) falsely claimed AIPAC buys politicians who are forced to take loyalty oaths to Israel. Omar apologized, before denying she had apologized for the remarks. The challenge is bipartisan. In 2016, AIPAC's president had to apologize after then-candidate Trump attacked former President Barack Obama over his record on Israel. This year's conference promises a warmer reception for the president. On Thursday, Trump announced his support for American recognition of the Golan Heights as within Israel's borders. Israel annexed the strategic highlands in 1981, but the United States had long maintained it was occupied territory. This entry was posted in Uncategorized and tagged 2020 Election, AIPAC, Democratic Party, Elizabeth Warren, Israel, Kamala Harris. Bookmark the permalink.